"In a little-noticed milestone, the latest data from Beijing and Washington shows that China passed the United States last year as the world’s largest consumer of electricity," reports the New York Times, in an article that is much more interesting for what it does notice: a growing restlessness in the utility industry about the government's price-setting practices. It is scary to watch the plethora of tornadoes sweeping death and destruction across my own country. Iceland is erupting and Taiwan had an earthquake. The prognostications about the Judgment Day may be wrong, but one cannot help but wonder how humanity can long endure in the face of so much chaos and extreme weather. 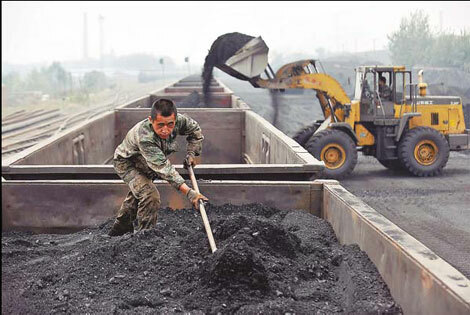 A worker at a railway station in Taiyuan, capital of Shanxi province, unloads coal from a cargo train on Tuesday. Railway authorities in the province are accelerating coal transportation to coastal regions that have been facing power shortages partially caused by severe drought. The major changes to the Yangtze caused by Three Gorges are a double-edges sword. The project is likely the root cause of the drought, but it does, at the same time, allow bureaucrats to open sluices and control where the water goes a bit better. "The Office of State Flood Control and Drought Relief Headquarters asked the Three Gorges Dam to increase water discharges to up to 12,000 cubic meter per second (about 3,000 cu m per second more than the water flowing in) from May 25 to June 10, in order to raise the water level in the middle and lower reaches." Please keep the people of these provinces in your thoughts and prayers. Government policies here will be less effective than prayer, I am afraid. "China’s 700 million rural residents have been on a two-year buying spree of electric devices, purchasing hundreds of millions of air-conditioners and other energy-hungry appliances with government subsidies aimed at narrowing the gap in living standards between cities and rural areas." [my emphasis] One cannot really ask: How many lives have been saved as a result of air-conditioning? One cannot really ask, Why do country people need to have the same amenities as city people or why do the city people set the standard for what we all need? One, certainly, cannot assert that the Chinese should not be permitted to have air-conditioners or drying racks if Europeans and Americans do.